This fall at the multiplex, Bradley Cooper becomes a director, Jamie Lee Curtis revisits her slasher-movie past, Queen’s Freddie Mercury gets the biopic treatment, Tiffany Haddish schools Kevin Hart and Neil Armstrong goes back to the moon. The fall season usually means a flood of Oscar-bait titles and so-called grown-up films, but we’ll also have more from Marvel comics (“Venom”), animated fare (the return of “Wreck-It Ralph”), comedies (“Second Act,” “Johnny English Strikes Again”) and even a western (“The Sisters Brothers”). Here’s a sneak peek at nearly 50 new films heading our way in the next three months. Sept. 21: Dan Fogelman, the creative force behind NBC’s “This Is Us” (which returns Sept. 25), shifts to the big screen with “Life Itself.” Oscar Isaac and Olivia Wilde lead an ensemble cast in a story about a young New York couple and their extended families, spanning continents and lifetimes . In “Colette,” Keira Knightly plays French writer Sidonie-Gabrielle Colette, the woman behind the controversial Claudine novels . Warlocks and witches are unleashed in “The House With a Clock in its Walls,” starring Cate Blanchett and Jack Black. It’s from director Eli Roth, who has made several blood-soaked horror films (“Hostel,” “Cabin Fever”). But this one is billed as a PG-rated, family-friendly fantasy. Sept. 28: Comedy cut-ups Tiffany Haddish and Kevin Hart team up in “Night School,” the story of adults taking classes to earn their GEDs. It’s directed by Malcolm D. Lee, who worked with Haddish on last year’s smash hit, “Girls Trip” . The animated adventure “Smallfoot” takes us to the icy north where a community of Yetis discovers a new creature: humans. With the voices of Zendaya, Channing Tatum and James Corden. Also in September: Anna Kendrick goes in search of Blake Lively in “A Simple Favor” . Jennifer Garner kicks into vigilante mode in “Peppermint” . Glenn Close plays the title character in “The Wife” . Vatican investigators try to unravel an apparent suicide in “The Nun” . And in “The Sisters Brothers,” John C. Reilly and Joaquin Phoenix portray assassins on the trail of a gold prospector in 1850s Oregon. Oct. 5: The fourth time is the charm. Bradley Cooper stars in and directed this fourth version of “A Star Is Born.” He plays Jackson Maine, a famous but troubled singer who discovers and mentors the talented but shy Ally (Lady Gaga). Her star rises, his drops and, well, you know, a tragic love story ensues . The terrific Tom Hardy (“The Revenant,” “Dunkirk”) stars in “Venom.” Hardy’s Eddie Brock acquires the powers of an alien symbiote, and is forced to unleash his vicious alter ego in order to save his life. 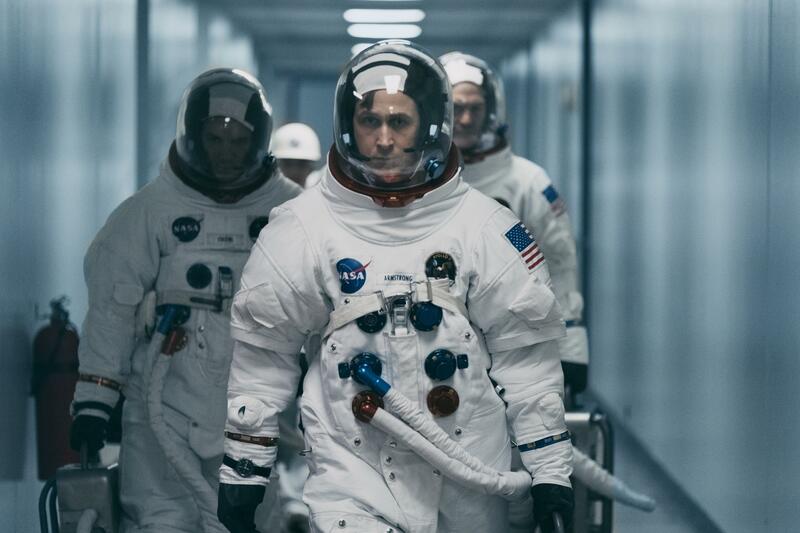 Oct. 12: The story of astronaut Neil Armstrong and his remarkable accomplishments in space are explored in “First Man,” with Ryan Gosling playing the Ohio native who landed on the moon in 1969. Gosling reteams with director Damien Chazelle (“La La Land”), and the strong cast also features Claire Foy, Kyle Chandler and Jason Clarke . Robert Redford has said “The Old Man & the Gun” will be his farewell to acting. It is based on the true story of serial bank robber Forrest Tucker, who kept up his larcenous ways well into his 70s . A confluence of weird, dark and desperate characters find themselves at a rundown Lake Tahoe hotel for one crazy night in “Bad Times at the El Royale.” Chris Hemsworth, Dakota Johnson, Jon Hamm and Jeff Bridges star. Also in October: Monsters and ghouls terrorize two boys in “Goosebumps 2: Haunted Halloween” . Jonah Hill wrote and directed “Mid90s,” a comedy-drama about teen skaters . Steve Carell and Timothee Chalamet star in “Beautiful Boy,” a drama about a family coping with addiction . Another family-in-crisis film, “What They Had,” deals with a daughter (Hilary Swank) returning home to help her ailing mother . “The Oath” leans on dark humor to explore modern political tribalism. Nov. 9: “Every Who down in Whoville liked Christmas a lot. But the Grinch . ” You know the rest. The beloved Dr. Seuss classic (so good on TV in the 1960s and so forgettable with Jim Carrey as the green grouch) gets an animated update with Benedict Cumberbatch voicing the Christmas-hater in “Dr. Seuss’ The Grinch” . Lisbeth Salander, from the late Stieg Larsson’s “Millennium” book series, returns to the screen. She’s been played by Noomi Rapace and Rooney Mara and now it’s Claire Foy (“The Crown”) as the outcast-hacker who takes on cyber criminals and government baddies. This one is based the post-Larsson novel “The Girl in the Spider’s Web” by David Lagercrantz. Nov. 21: This is the classic day-before Thanksgiving release spot and it’s overloaded this year. Michael B. Jordan and Sylvester Stallone are reunited in the “Rocky” offshoot “Creed II.” Adonis Creed takes on Viktor Drago (Florian Munteanu), son of Ivan Drago (Dolph Lundgren) from “Rocky IV” . Likable but clumsy Ralph (voice of John C. Reilly) returns in “Ralph Breaks the Internet” (aka “Wreck-it Ralph 2”) . The rise and fall of former senator Gary Hart (Hugh Jackman), whose presidential hopes went down in flames, is chronicled in “The Front Runner” . The 1960s-set “Green Book” teams Viggo Mortensen and Mahershala Ali as a driver and musician confronting racism in the American South . And, yes, yet another “Robin Hood” is headed our way. I’ve liked various Robins over the years, and I especially enjoyed Ridley Scott’s rendition in 2010 with Russell Crowe and Cate Blanchett. It was also a big, fat bomb. Last year’s King Arthur was an even bigger, fatter bomb. One too many reboots? Perhaps studio heads think anything that sounds vaguely medieval and “Game of Thrones”-ish is worth a shot. Published: Aug. 30, 2018, 11:30 a.m.